One of the most important factors in player performance is what kind of 'fuel' they eat before a game. Unfortunately due to busy schedules, families can find themselves eating on the fly. While fast food can be a quick lifesaver, making that the habit can have negative effects on everyone in the family. 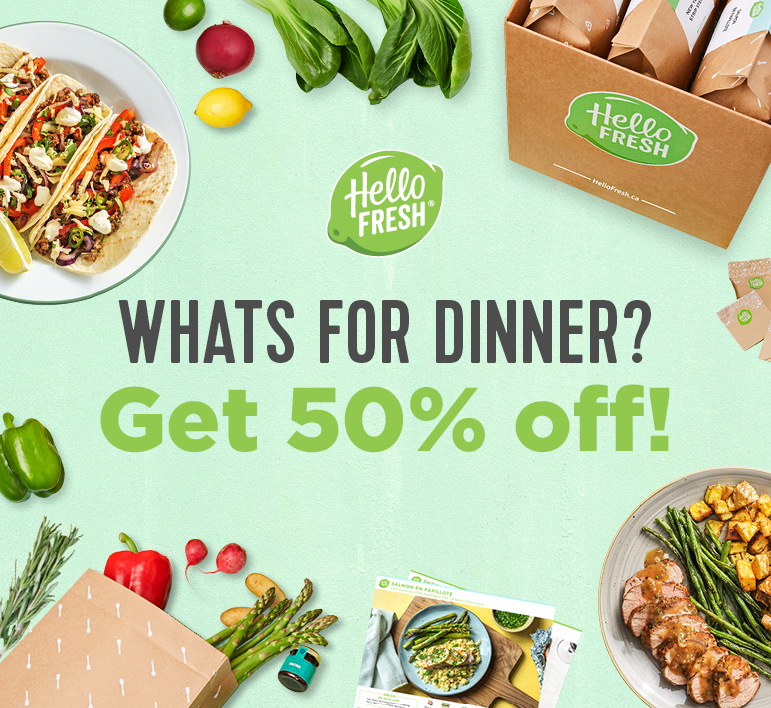 HelloFresh solves that problem by creating stress-free dinners that take less than 40 minutes to cook. They bring healthy, easy-to-make meals to the kitchens of busy hockey families that come with step-by-step instructions. Knowing what you'll be making and how long it will take is information valuable to anybody as busy as a hockey parent. 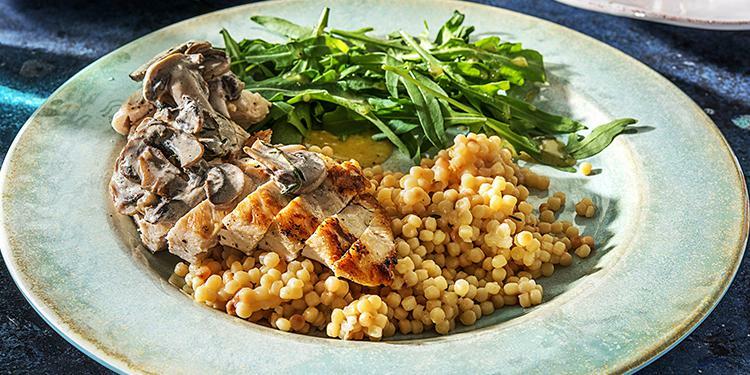 The Pan Roasted Chicken with Dijon Mushroom Sauce and Israeli Couscous is the perfect meal that combines nutrition with timeliness and taste. From the arugula (calcium) and mushrooms (fibre), chicken (protein) and couscous (carbs to burn), every aspect of this meal provides needed energy right before a game. This recipe is easy to make and you can get your kids involved in helping prepare the meals. Young children can assist in areas like whisking the sauce while those a bit older can help with cutting the vegetables. It takes just 35 minutes of cook time to get this pan roasted chicken meal done in six easy steps. Wash and dry all produce. Mince or grate the garlic. Strip 3 tbsp thyme leaves from the sprigs. Heat a medium pot over medium heat. When the pot is hot, add 1 tbsp oil, then half the garlic and half the thyme leaves. Cook until fragrant, 1-2 min. Add the couscous and stir together, until toasted, 2-3 min. Add 2 2/3 cups water and 2 pkgs broth concentrates to the medium pot. Cover and bring to a boil over high heat. Once boiling, reduce the heat to medium-high. Simmer, still covered, until the couscous is tender and all the liquid has been absorbed, 10-12 min. Meanwhile, pat the chicken dry with paper towels. Season with salt and pepper. Meanwhile, thinly slice mushrooms. When chicken is done, transfer to a plate and cover to keep warm. Set aside. Increase heat to medium-high. When same pan is hot, add another 1 tbsp oil, then mushrooms. Cook, stirring often, until golden-brown, 6-7 min. Add the remaining garlic and remaining thyme leaves. Cook, stirring often, until fragrant, 1-2 min. Remove the pan from the heat. Stir in the sour cream, 2 1/2 tsp mustard, remaining broth concentrates and 1/2 cup water. Season with salt and pepper. Set aside. In a small bowl, whisk together the vinegar, marmalade, remaining mustard and 2 tbsp oil. Season with salt and pepper. When the couscous is done, fluff with a fork and season with salt and pepper. Thinly slice chicken. Divide couscous, chicken and arugula between plates. Drizzle as much dressing from the small bowl as you like over arugula. Spoon mushroom sauce over chicken.